With the special primary election for Florida Congressional Dist 19 just days away (Feb 2nd)things are heating up and getting quite nasty between the three Republican candidates. Front runner Edward Lynch is being attacked by his two opponents. In fact it has degenerated into a very dirty nasty race. Lynch has been running for this seat since 2008 when he ran against Robert Wexler in a very strong Democratic district and had a fairly decent showing in the polls. Lynch had never involved himself in politics until he ran up against the do nothing Congressman for his district. Wexler meanwhile, resigned a few months ago under a cloud of accusations that he did not live in his district or even in the state for that matter, and an ongoing investigation by the FBI into money laundering. With this resignation which came into force at the beginning of this year we had an empty seat that needed to be filled. Lynch, who was in the middle of a campaign for the Nov 2nd mid-term, elections, suddenly had to accelerate everything to accommodate these new election dates of Feb 2nd and April 13th. His Democratic opponents in this race are Ted Deutsch and Ben Graber, with Deutsch being the front runner and who has almost been anointed by Wexler as his successor as he left office. The Democratic Party does not want to lose this seat, especially so soon after their catastrophic loss of Ted Kennedy’s empty Senate seat in Massachusetts. They will flood Deutsch’s campaign with money and will be sending down their big guns for fund raising and campaigning for him. When Wexler resigned two new ‘Republican’ candidates came out of the woodwork and started running. As it became more and more apparent that they would not beat Lynch and more especially Deutsch they got desperate they joined together and started a really nasty rumor campaign against Lynch. At a recent debate both Curt Price and Joe Budd said that they would not support Lynch if he won the primary! Edward Lynch, on the other hand, said that he would support whoever won. It is after all, for the good of the country that he is even running at all. What are these two men doing and why? They themselves cannot win this race in either the primary of the special election against Ted Deutsch. Lynch is, in my view, the only hope for Conservatives. So what is in it for these others to engage in the politics of personal destruction? The rumors and accusations have been thrown out there in the public domain with no explanation of what they are, from either Price or Budd, leading the public to wonder what it is all about and opening the door to all sorts of speculation as to what it might be. When in fact none of this is new and all came out in the last election cycle. Price and Budd have started up a Facebook page and a website to spread their lies under the names of LynchsLies and Edgar RINO. Lynch has been invited to sit on a panel called Rising Young Republican Stars at CPAC next month. Right about the time that Price and Budd started the smear campaign against Lynch he received a phone call from CPAC telling him that he could not sit of the panel if he did not win the primary! Now did Price and Budd have anything to do with this? We don’t know for sure, but it is very suspicious, don’t you think? Lynch has issued a rebuttal of the accusations leveled against him, with the aim of putting everything to rest. 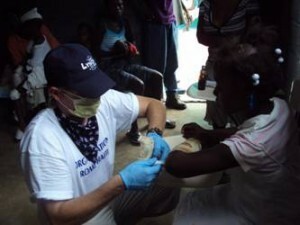 Edward doing triage work in Haiti. Lynch has worked tirelessly for the constituents of his district even when Wexler was their Congressman as Wexler would do nothing to help them. He worked on behalf of the Veterans of the Miami Palm Beach area hospitals because Wexler would do nothing and for that he was punished by our Government. Lynch has just returned from a two day visit to Haiti along with the Republican candidate for dist 20 Robert Lowry, and candidate for dist 24 Tom Garcia, who along with candidates Bernard Sansaricq running for dist 23 against the corrupt Congressman Alcee Hastings (an impeached Federal Judge! ), Corey Poitier candidate for dist. 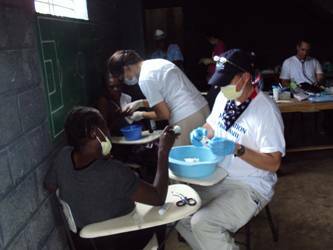 17, Yomin Postelnik running for the Florida State House dist 91, and Congressman Lincoln Diaz from Miami, all formed a group working to gather supplies and medical first responders to go to Haiti to help in the earthquake disaster. Lynch put his campaign on hold just three weeks before the election to do this demonstrating cleanly that the suffering of the people of Haiti was upper most in his mind. What did Price or Budd do? Nothing we are aware of. Note that all these candidates and Congressman who have dropped everything to, help the poor people of Haiti are Republicans. My own Congressman Tom Rooney and State Senator Joe Negron also have visited Haiti. Lynch has shown his compassion and humanity for the less privileged, and leadership by teaming up with all the other Republican Congressmen and Republican candidates of South Florida for the needs of others. We absolutely do not need to add any more Rinos and ‘do nothing’ Democrats than we currently have ‘serving’ us in DC. Please do not believe the lies you are hearing and give your support to Edward Lynch on Feb 2nd! If you live outside his district you can still support him with donations and phone calls for him like we, the Grassroots of American, did in the Scott Brown race in Mass. Let’s not have another NY CD23 debacle, when Scozzafava pulled out of the primary race at the last moment leaving Hoffman to run against the Democratic candidate and then refused to support the Republican candidate throwing her weight and votes to the Democrat who ultimately won that race by a very narrow margin. It feels to us down here in South Florida that something similar is being attempted here to sabotage Lynch’s campaign. Don’t let it happen. He can win this race if we all get behind him and it would deliver another huge black eye to the Democratic machine! Editor's note: This post marks the first of what I hope are many from Shona Darress. I've watched her postings on Facebook for some time now, and have admired her work. I asked her recently to step outside that role and into "Bigtime Blogging"... mostly because I thought she'd fit in well among all the miscreants that write here... and she has delighted me by agreeing to do that. I'm glad as I can be to have her talents posted here. Shona's backstory is interesting, and I suppose a lot of her unique insights are due to her background. She is originally from Invercargill, New Zealand and lived there until leaving on a world tour (chuckle !! ) in 1969. She has lived in England two years, Germany 3 months, and Libya 7 years before finally settling stateside. She became a naturalized citizen in 1989. She has five kids, the first born in London and the next two born in Triploi Libya and the last two born in Singapore. She also has 7 grandchildren, all of which live in her adopted home of Stuart Florida. Her husband Bart, is a directional driller of oil wells currently working in the Bakken Field in North Dakota, that we've reported on frequently here at BitsBlog. Before working in ND he worked in the oil fields all over the world. Hi Eric,Nice post! I was somewhat aware of the ‘politics’ in South Florida. However, your post took it to a new level for me. Thanks for the insight. Well, it’s not my post, but Shona’s. Note the Editor’s note at the end.